Stamford Mayor David Martin maneuvers the Clifford balloon at the 2018 Stamford Downtown Parade Spectacular training session at Latham Park in Stamford, Conn. Thursday, Nov. 8, 2018. Volunteer balloon handlers and representatives from Stamford Downtown Special Services learned to maneuver the 40-foot Clifford the Big Red Dog ballon in preparation for the parade on Sunday, Nov. 18. 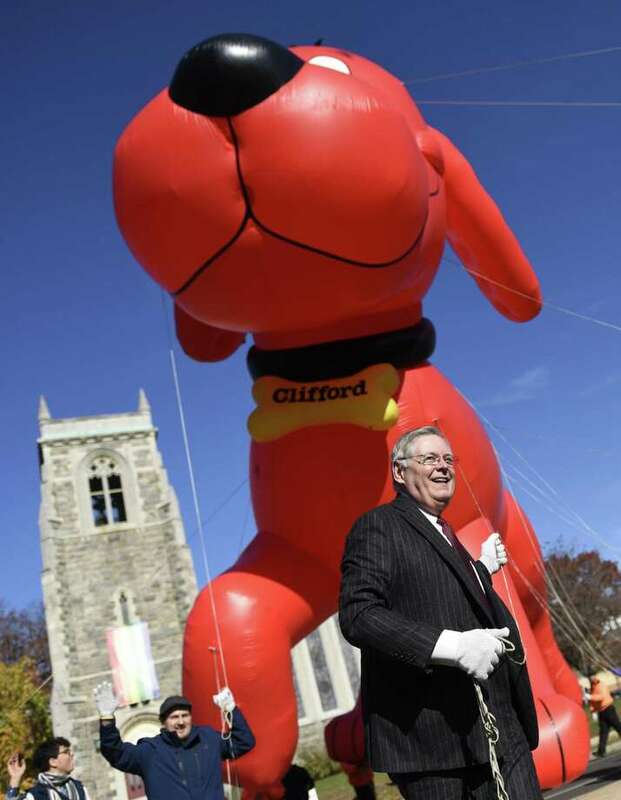 STAMFORD — Latham Park swapped out Marilyn Monroe for Clifford the Big Red Dog on Thursday. The cartoon-character-come-to-life was on display as a teaser for the upcoming 25th annual Stamford Downtown Parade Spectacular set for Nov. 18 and will feature about a dozen inflatable characters, including Elmo, Shrek, Big Bird and Paddington Bear. The only obstacle of a full balloon parade is weather, as heavy winds caused the balloons to be canceled two years ago and prevented them from flying high last year. “It’s going to be a great parade, and if we are lucky enough to have weather like this, it’s going to be an all-star day,” said Sandy Goldstein, president of the Stamford Downtown Special Services District, referring to the perfect weather on Thursday afternoon. Stamford Mayor David Martin was in a whimsical mood Thursday, gleefully promoting the parade. “One score and five years ago, our DSSD and Sandy Goldstein brought forth to this great city a new idea, conceived in fun and excitement for kids of all ages, and here we are 25 years later,” he said. Martin said the parade has been a positive for the city and its businesses. Martin also participated in a brief training session Thursday for handlers using the Clifford balloon, as “Who Let the Dogs Out” blasted over the speakers. Martin held a rope attached to Clifford’s head during the demonstration. When the rope handlers were instructed to lower Clifford, Martin found himself cheek-to-cheek with the classic canine character and gave him a kiss. “It’s going to be a fabulous event,” he said. 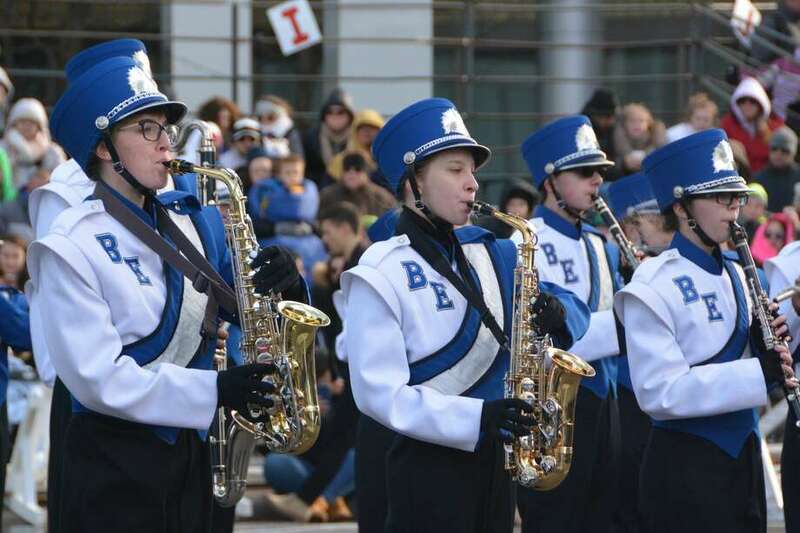 The downtown parade was originally comprised of only marching bands and traveled down Bedford Street, from Latham to Veterans parks, and back. Goldstein joked that only 15 people watched the first parade, most of whom were her family. The route is now about a mile long, and includes the fan-favorite balloons. The parade travels south on Summer Street, starting from Hoyt Street, then turns east on Broad Street, making a quick right turn onto Atlantic Street. The route ends just past Tresser Boulevard. Besides balloons, the parade will feature dance troupes such as the Locust Performing Arts Center of Stamford, 11 marching bands from Stamford, Westchester County, and Long Island, as well as a bicycle stunt team performance. Four floats will also be featured in the parade, including one carrying Stamford Teacher of the Year Camille Spaulding, a seventh-grade social studies teacher at Cloonan Middle School. The parade’s presenting sponsors are the Residence Inn and Courtyard by Marriott Stamford and Hearst Connecticut Media Group. The festivities start the day before with a giant balloon inflation party from 3 to 6 p.m. Nov. 17 at Summer and Hoyt streets. Arnold Knittel, an associate engineer with the city, has been volunteering at the parade for 18 years. He became so accustomed to handling the balloons, that he graduated from balloon handler to captain, leading a team of about 16 handlers along the parade route. Knittel said he looks forward to the parade every year. “You see all the thousands of people, everyone is waving at you, it’s exciting,” he said.